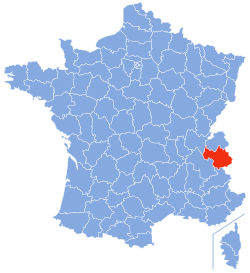 Savoie (pronounced [sa.vwa]; Arpitan: Savouè d’Avâl, Italian: Savoia, pronounced [saˈvɔja], Inglis: Savoy, /səˈvɔɪ/) is a French depairtment locatit in the Rhône-Alpes region in the French Alps. Thegither wi the Haute-Savoie, Savoie is ane o the twa depairtments o the historic region o Savoy that wis annexed bi Fraunce on 14 Juin 1860, follaein the signatur o the Treaty o Turin on 24 Mairch 1860. For history afore 1860, details o the annexation, an modren regionalism, see Savoy. This page wis last eeditit on 11 Mairch 2018, at 07:05.